So, here's another Dumarest of Terra book I finished this summer. It's called "Veruchia," and is the best one so far. Veruchia is one of two possible successors to the planet Dradea's throne, but her power-hungry cousin is determined to inherit, even if it means eliminating the competition. 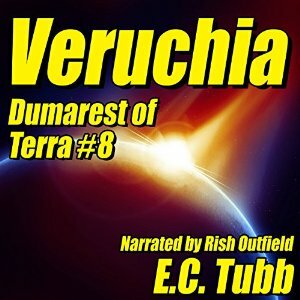 Enter Earl Dumarest, stuck on the planet and forced to do battle against monsters for entertainment, until he is hired to be Veruchia's bodyguard. Will they fall in love? Of course they will. Will Earl finally discover the location of Earth? Of course he won't, not when there's another two dozen of these books on the horizon. It is my favorite of these books, as I mentioned. Of course, it does have a couple of interesting subplots that are introduced and then abandoned, and the chapters are so depressingly long as to keep me from doing more than one in one recording/editing session. But I liked the this book quite a bit. You can find it at this LINK and spend your valuable credits and/or money on it. These books have taken me an insanely long time to get recorded, to the point where I guess I have been replaced as the narrator in question for the series. I'm of two minds there, but I do admit that it's my fault for not having worked harder to get these out by the deadline (or even within a year of the deadline).